St. Barthelemy, St. Barths - ~A~ Taste of Paradise! 'La Belle Vie' is a 2008 stunningly restored and expanded villa with 180 degree views of Marigot Anse and the Caribbean beyond! Expansion includes the Living/Great Room with sliding glass walls onto the terraces, gardens, pool, Master Bathroom and garage (3 'island' cars). Sophisticated decor and tropical breezes...beautiful views day and night!! Keywords: Single villa, one floor living, spacious. Living in the Main Line suburbs of Philadelphia for 50 years, I 'discovered' St. Barths when trying to get away from the gray winter months. Having experienced many beautiful islands over the years, the moment I arrived in St. Barth's Gustavia harbor, I felt it was my destiny and it would be the destination of choice for people wanting to experience a luxury island. The turquoise waters of 20 beautiful beaches, extraordinary French cuisine, hiking to amazing natural pools, shopping in boutique and major designer shops...Hermes, Dior, Bulgari..just a few that watch over the harbor! Fantastic sunsets are de riguer...sunrises as spectacular! I found there is really nothing St. Barth's is lacking for your vacationing pleasure! I purchased this villa because it has beautiful views and is very centrally located. Although I had to reduce it to a shell and undertake major renovations and additions, the end product became the reality of a dream I had harbored for many years! The decor is neutral, the floorplan is open and invites the view of Marigot Anse inside through a window wall of sliding doors. The kitchen is exceptionally well-equipped...even for the gourmet cook. The master suite features a large bedroom with high beamed ceilings and a new master bathroom with an oversized stall shower and double vanity. Two additional bedrooms are quietly located at the opposite end of the villa, each with French door access to a terrace and/or terrace and pool. There is a full laundry room downstairs off the garage at street level. Master Bath is large with oversized shower and double bowl marble topped vanity. 2nd Bath has large shower and granite topped single vanity. Gustavia: Hermes, Prada, Dior, Bulgari, Calypso & stylish boutiques! Marigot Anse, across the street, is an inlet that is protected from the use of any motorcraft, so clear and pristine that it is renown for snorkeling. G. Cul de Sac is shared by Sereno & Guanahani. A 2-minute walk, just across the road. Room for 2-3 small cars. Nespresso, French Press & drip coffee maker at your disposal. Gourmet equipped: gas stove, full dishwasher, microwave, Liebherr refrigerator, granite countertops. Table is extended, seats 6-8 comfortably. Villa is surrounded by limestone terraces. Beautiful view of Marigot Anse. St. Barths is an island unlike any other...local residents are lovely and respectful of their island. Star-gaze at the cloudless night sky or at celebrities by day on any of the 20 beautiful public beaches or on the promenade of la Rue de Republique in Gustavia while satisfying your shopping gene at Hermes, Dior, Bulgari, Cartier. A stroll along the harbor reveals yachts of indescribable luxury, bumper to bumper! Restaurants/cuisine is second to none, art galleries dot the island. Casual dress by day, casual-chic by night! Pace yourself, an amazing combination of vacation experiences await you in St. Barths and 'La Belle Vie'! Beautiful island ... well equipped home. We throughly enjoyed our visit to St. Barths. The home is very centrally located on the island and it was quick to get around. The roads are extremely narrow and that takes some adjustment. We extended our stay and Marjorie was very accommodating with the request. When we stayed at the home it was just two adults but it could easily accommodate a larger family with children. The kitchen had everything to prepare meals and enjoy your stay. The restaurant recommendations were great and we had dinners out every night. I have vacationed in St. Maarten, Hawaii, Mexico, Aruba, Dominican Republic, Bahamas, St Thomas, Jamaica,and St Lucia and this was by far the nicest island I have ever visited. What a pleasure..from our 1st contact through your stay! Looking forward to your return with your family! I couldn't be more pleased!! We have been renting La Belle Vie for many years and can't imagine staying anywhere else! The house feels fresh and clean with lovely furnishings, crisp cotton bedding, and every comfort. We have stayed in luxury hotels in St. John, St. Thomas and St. Barth's, and have discovered that our entire family of 5 (plus the occasional grandparent) prefers Marjorie's La Belle Vie on St. Barth's to any other place we have been. The kids (now teens) think of it as "their" place and won't even consider going anywhere else - affordable, easy, lovely - we aways experience 'the good life' at La Belle Vie!! How lovely of you! I am always so happy to have you enjoy 'our' home in Paradise and look forward to your next stay! La Belle Vie is calling!! I had been to St. Barths twice before but my husband had not been there. We had both been working pretty long hours and wanted a place to just relax and enjoy the scenery and each other. We did all of this and more. We were able to enjoy the scenery, eat wonderful meals in and out, shop and then ....there is the pool......we could not stay out of it. We would have a relaxing breakfast at the pool, and then lunch and go out and explore, have dinner and find ourselves having a night swim.....quiet, relaxing and all that we wanted. We will make plans to go back.......My husband is now a St. Barths fan and we will stay at Le Belle Vie. La Belle Vie allowed us to have an incredible vacation. We stayed in a hotel last visit but much preferred the ample space, freedom and extras that this villa provided. What we liked best: the patio with a sparkling pool and sunshine all afternoon; crisp, white and seagrass island casual furnishings; comfy beds and a perfectly stocked white and stainless kitchen. Every room from bathroom to kitchen was very clean. The location by Marigot Bay was super convenient for exploring St Barth's Beaches (our favorites: Shell, St Jean at Nikki Beach, and Marigot, a short walk down the street); Gustavia's harbor/shopping/people watching; and the numerous restaurants scattered all over the island. Our favorite night was probably the one we cooked at home, grilling up fresh fish that had been caught that day. The manager of the home lives nearby and was extremely helpful when we called her for advice on about the island. The American owner was pleasant and easy to deal with -- she responded immediately to our questions before the trip. Bonuses at La Belle Vie: washer/dryer, covered parking, wifi and Apple TV. CT family of 4 LOVES LBV! We have stayed at this property for four years at high season for two weeks at a time. 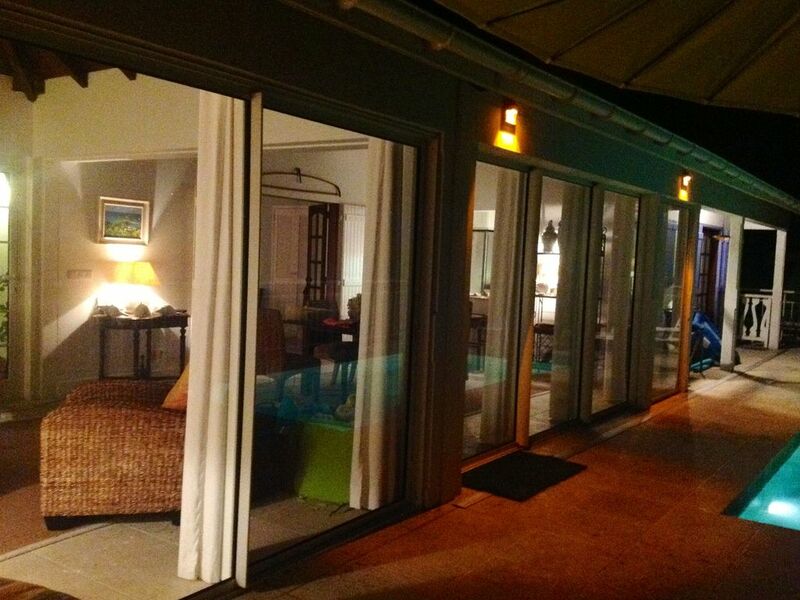 We consider it our St. Barths "home away from home." Each year we arrive to our Christmas decorations set up in advance by the lovely house manager, and our beach toys and chairs have been stored, cleaned and ready for use. And, there is roasted chicken, chilled rose, a fresh baguette and a fruit basket in the refrigerator. That level of care says everything about this property! When we started renting this house, after having rented many villas and experienced many 5 star hotels on the island, we found it ideal because we have two young children. Finding a villa where all of the bedrooms have doors to the main living areas was not easy. We were delighted with the layout -- a master bedroom and bath and two smaller bedrooms that share a bath. Moreover, I am a neat freak. Not only is the furniture clean and attractive, but I have never seen an ant in the house -- a true rarity in St. Barths! Furthermore, the home is very centrally located. It is an easy driving distance from St. Jean and many of the resorts and beaches that we like to frequent. We go to St. Barths for the beaches, so the fact that the pool is relatively close to a road does not bother us in the least. The views of the water are spectacular and we do not notice any noise from the road. We have visited many homes on the island and found La Belle Vie to be a great value when we factor in the things that we care about -- cleanliness, layout, location and value for price. To find what one reviewer seems to have sought, one would have to pay multiples of what the owner charges for this home. Furthermore, both the owner and the house manager truly care about us and our experience. Emails are sent in advance asking if we have any special requests. Transportation help from the airport is offered and any requests or questions are promptly responded to. The house manager's husband, who is a fisherman, even brought us fresh mahi mahi for one of our dinner parties. Without ever having met the owner of this home, we feel like we are close friends. I cannot recommend LBV more highly. We look forward to many more happy family holidays there! I paid up front for a 4 week stay at La Belle Vie which started on Nov 19 2012 and I cannot think of how I will endure the rest of my stay of almost three weeks.The listing description misrepresents the house and pool by not disclosing that both are directly on/next to two intersecting steep roads which has local truck,bus, car and moped traffic starting at 6.30am until as late as 10pm. From 8am-11am and 4pm-8pm the din is deafening and the toxic fumes nauseating.We work inside and need the pool for physical therapy exercises, both of which are impossible under the circumstances. Moreover,the carport area is one floor below the main house.The only one access to the front door of the house is by way of a steep flight of 15 outdoor steps, without handrail. This is NOT the one floor living as advertised. I have 2 metal hips and need single level living and was duly misled by the description. I have to hold onto the wall as there is no handrail. There are mosquitoes and biting gnats from 4.30pm onwards through the night. The house has not a SINGLE screen that would allow keeping a door or window open without insect invasion.The noise and fumes from the street traffic are enough to discourage opening windows or doors! Bed mites in bedding and upholstery join the insect problem.The owner has not been helpful when addressed directly. There was owner denial that any noise/fumes exist. There was no response by owner to the insect infestation. The local house manager, maid and handyman all relate that noise and fumes are undeniable and substantiate that there have been problems with previous tenants at the house. I have had to leave the house and to rent something else for several days to enable some form of disinfecting and cleaning of the bedding and upholstery and much needed vacuuming, as I am asthmatic and allergic to the insecticides.The photos of the house furnishings are representative, but the description that there is a 180 degree views of Marigot bay is a misrepresentation. The overiding view from the front of the house is a very busy road. We cannot recommend this property to friend or relative because of our unabated suffering.However, we CAN state clearly that St Barts is a terrific island. An 8-square-mile island, it takes only 20 mins. to get anywhere by car. Immediately accessible to 2 of the island's 17 beautiful beaches and 5, 5-star French restaurants, you can lunch seaside while enjoying the best watersports beach, Grand Cul de Sac..snorkeling to wind-surfing, on the island!